Designing a worming programme for your horse or pony is a very individual process which depends on the specific needs of your horse, his management and yourself as a horse owner. The other components of an equine worming programme include regular removal of droppings - "poo picking" - from the horse's pasture, rotation of pasture, treatment and management of new arrivals and general pasture management. It is also important to be aware of worming myths - if you follow these they can have a detrimental effect on your horse's health. Horse faeces are the source of worm eggs that contaminate pasture and lead to reinfection. Worm eggs can persist on pasture for considerable periods, up to a year in some cases. All equine pasture will be contaminated with worm eggs, to some extent, if it has been grazed by horses within the preceding 12 months. Horses are not equally susceptible to the adverse effects of worms - it can be difficult to identify those who are more resilient and those who are more vulnerable. Try not to rely solely on the wormer. 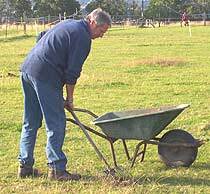 Adopt the best pasture management tools and practices that you can. Monitoring Worm egg counts can help you decide if a worming is necessary - too frequent worming of horses can lead to worms becoming resistant to wormers. Look at your horse or pony's individual circumstances and ask advice of an expert, such as your vet, before coming up with a definitive and suitable programme tailored to your horse. New horses or ponies arriving at a yard or stables should be treated as potential sources of worms and, perhaps, resistant species of worm. They should be isolated from your herd and grazing until they have been treated with your "new arrival programme" - something you should discuss with your vet. This is designed to clear out the horse's system before he gets onto your grazing and potentially contaminates your pasture or grazing land. In an ideal world we would all pick up each pile of droppings the moment it hit the grass, monitor the egg count in the faeces and only administer wormer once eggs had begun to reappear in the faeces. However, we all realise that this situation is not possible. We know that most horses will not have eggs in their faeces for a certain time after they have been wormed. 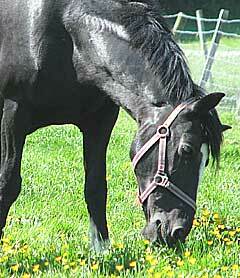 The length of time varies, depending on which wormer has been used. The interval between doses of a particular wormer is the sum of the average life-cycle time of the worms, which is roughly three weeks and this period of after doing effect. Horse wormers are a useful tool, but they have been abused and misused over the years - The result of this is the emergence of of worms which are resistant to the drugs used to kill them. Advice about designing an effective equine worming programme for your horse or pony. Create an individual process to control worms in horses which depends on the specific needs of your horse and his stable management.